Over the years, a number of rules of thumb have been proposed to help the electric flyer choose a power system for his or her plane. This month, I’m going to attempt to consolidate some of these rules and provide a recipe for power system selection. This is probably the best known rule, and I believe it was originated by well known electric flight guru Keith Shaw. It states that for reasonable sport performance, a plane’s power system should have at least 40W of power per pound of airplane for basic sport flying, or 70W per pound for strong aerobatic capabilities. These figures are input power, which is the power entering the motor (Volts times Amps), and assume a motor that is about 75% efficient. It also assumes that you’ve chosen a propeller that (a) causes the motor to draw that amount of power efficiently, and (b) is well suited to the flight characteristics of the aircraft. Another rule is that the chosen propeller should result in a pitch speed equal to 2½ to 3 times the aircraft’s stall speed. I mentioned this rule briefly in last month’s article as well. A third rule concerns the thrust needed for different kinds of flight. The more thrust you have, the steeper your plane can climb (so long as the motor and propeller are still operating efficiently). Minimally, thrust should be 1/4 of the plane’s weight, but 1/3 to 1/2 is better. A thrust greater than or equal to weight will give unlimited vertical performance. So how do these rules all fit together? As we’ll soon see, the Watts per pound rule is really a simplified summary of the combination of the other two rules. As electric flyers, most of us know that power (measured in Watts) is equal to current (in Amps) times voltage (in Volts). For an electric power system, this is the "input power", namely the power going into the motor. A twin-motored, tricycle-geared, electric conversion of the Sig LT-25. This one is powered by two geared Kyosho Atomic Force ferrite car motors, together drawing about 27A from 14 cells (380W). It weighs 105 oz. Good quality props and ball-bearing gearboxes help minimize inefficiencies and maximize output power. Power is also equal to force times velocity, or in model airplane terms, thrust times pitch speed. For this value to be in Watts, thrust must be measured in Newtons (N), and pitch speed in metres per second (m/s). This however is "output" power, which is the ability to make the plane move. There are two or three power-robbing numbers between input power and output power, and these are motor efficiency, propeller efficiency, and gearbox efficiency if a gearbox is being used. We now have a formula to compute the required output power given the desired thrust and pitch speed. One of our rules of thumb suggested thrust should be 1/4 to 1/2 of the plane’s weight, but what should the pitch speed be? Now that we have a way to estimate stall speed, we can compute the desired pitch speed by multiplying by 2½ to 3. This leads to a recipe for choosing a power system. Based on the weight of the model and the desired performance, determine how much thrust you need (about 1/4 of the plane’s weight for a sedate flyer, 1/2 the weight for a sport flyer, or even more for a high-powered aerobat). Based on the wing loading, determine the stall speed, and multiply this by 2½ (for a sport flyer) to 3 (for an aerobat) to determine the pitch speed you need. Multiply the thrust (in oz) and pitch speed (in mph), and divide by 8 to determine the required output power (in W). Estimate motor efficiency. A good approximation is 60% for a cheap ferrite motor, 70% for a high-quality R/C car ferrite motor, 80% for a cobalt motor, and 90% for a brushless motor. These values assume you are operating the motor under conditions where it is maximally efficient (i.e. you’ve picked an appropriate motor). Estimate propeller efficiency. This is hard to do, since efficiency can vary from about 50% for a poorly designed propeller to 90% for a really good one. My best guess would be about 70% for a typical Master Airscrew or Top Flite propeller, 75% for a Master Airscrew Electric prop, 80% for an APC, and maybe 85% for a high quality carbon propeller such as the Graupner CAM series. If you plan to use a gearbox, estimate gearbox efficiency. This is also hard to estimate, but gearboxes are generally 90% to 95% efficient. Using the efficiencies you estimated in steps 4 through 6, calculate the required input power to achieve the output power you calculated in step 3. Do this by dividing the output power by the product of the efficiencies (expressed as decimal fractions). Determine how many cells you need by dividing the input power from step 7 by the current you wish to run at (a NiCd cell provides about 1V at typical e-flight current levels). With 2000mAh cells, 25A will give reasonable flight times. With 600mAh to 1000mAh cells typically used in Speed 400 models, 10A will give reasonable times and remain within the abilities of the motor. Select a motor that will draw the desired input power at the desired current and cell count. Many motor manufacturers provide tables giving this information. Others will be able to recommend a motor from their product line. Starting with a propeller recommended by the motor manufacturer, do some bench tests to find the right propeller. What you’re looking for is one that results in the desired pitch speed (from step 2) at the desired current and cell count (from steps 7 and 8). To do this, you’ll need a means of measuring current and rpm. Pitch speed is approximately equal to the propeller’s pitch times rpm, divided by 1000. When you’re done, you should have a power system that will provide the level of performance that you planned for. Once your plane is flying though, it’s worth experimenting by altering propeller sizes and/or gear ratios. Sometimes a slightly higher pitch works better (some propellers untwist a bit in the air). Sometimes a change of propeller brand can improve performance. Let’s plug in some numbers for a simple example, a 48 oz, 3 sq.ft sport plane. We want reasonable aerobatic performance, so we’ll choose a thrust of 20 oz, and a pitch speed of 2½ times the stall speed. The stall speed is about 4.4 × SQRT(48/3), or 18 mph. Pitch speed should therefore be 45 mph. This means we need about 113W of output power (45 mph × 20 oz / 8). This plane is to be powered by a cobalt motor, which is about 80% efficient. We’ll use a good quality propeller which is also about 80% efficient. That means we’ll need about 177W of input power (113 / (0.8 × 0.8)). To produce a 177W at about 25A requires seven cells. The recipe applies to small models too. These Speed 400 planes draw 10A from 7 cells (70W). Due to the low efficiency of both the motor and propeller, only about 35W of useful power is produced, but that’s enough to fly both models well. 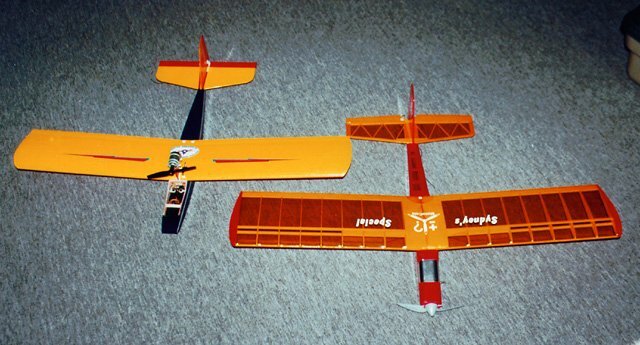 The one on the left has 1.5 sq.ft of wing; the one on the right has 1.9 sq.ft. Both weigh about 18 oz. From the graph in Astroflight’s Electric Motor Handbook, we can see that the Astro 05 sport motor produces about 140W of shaft power at 75% efficiency at 25A. This translates into 187W input power at 25A, which is fairly close to our 177W figure. From the same graph, we can see that a 7.5×4 propeller would draw 25A from seven cells. Bench testing with such a propeller would give us about 13,000 rpm. This gives a pitch speed of about 49 mph. That’s slightly higher than the 45 mph we were aiming for, but still lower than 3 times the stall speed (which would be 54 mph). Since we’d be unlikely to be able to find a 7.5×4 propeller, we’d probably end up using an 8×4 instead. This would lower the rpm and hence the pitch speed. The formula works just as well for a larger model, such as a Sig LT-25. Electric conversions of this plane usually end up weighing about 96 oz, and we’ll choose a thrust of 40 oz and a pitch speed of 2½ times the stall speed again for trainer-like flight. 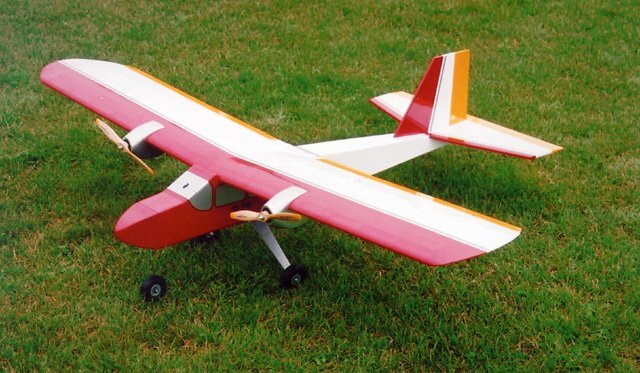 The LT-25’s wing area is 5 sq.ft, so the stall speed will be about 4.4 × SQRT(100/5), or 19 mph. Pitch speed should therefore be 48 mph and we’ll need 240W of output power (48 mph × 40 oz / 8). Let’s again use a cobalt motor and good quality props, so input power will need to be about 375W (240 / (0.8 × 0.8)). At about 25A, this would require 15 cells. The Astro 25 sport motor will use about 370W on 14 cells at 25A. That sounds close enough. The recommended prop at this current and voltage is 9×5.5, and this would turn at about 11,700 rpm, giving a pitch speed of 61 mph. This is a bit high, so we could try a 10×5 prop instead, which would turn at about 11,000 rpm, giving a pitch speed of 52 mph, which is close to what we wanted. This recipe can be applied just as easily to models with two (or more motors). After step 3, divide the required power by the number of motors and follow the rest of the recipe for just one motor. At step 8, divide your desired overall current by the number of motors if the motors will be wired in parallel. After step 10, multiply the number of cells by the number of motors if the motors will be wired in series. Let’s briefly look at the LT-25 as a potential twin. With two motors and props, each will need to produce 120W of output power (for 240W total), and each will need 200W of input power (120 / (0.8 × 0.8 × 0.95), the 0.95 is for the gearbox efficiency). From the Electric Motor Handbook again, an Astro 05G with the standard 2.38:1 gearbox will use about 200W of power on 7 cells at 25A with a 12×8 prop at about 5,400 rpm. This gives a pitch speed of about 41 mph, which is not high enough. An 11×9 propeller will give about 48 mph at only slightly less current. The resulting power system would consist of two Astro 05G geared motors wired in series, two 11×9 propellers, and 14 cells. A little bit of math can vastly improve your chances of successfully electrifying an airplane, whether it was designed for electric power, or is a conversion of a glow model. All the formulae I’ve presented are only approximations, but they’ll get you close to the ideal power system for a given set of requirements. From there, you can experiment to tune things further.